The regular season is starting to wrap up for many high school football teams across the nation, which means play-off action will be starting soon. This week's edition includes updates on both 2015 and 2016 verbal commits and prospects. Blue Devil Nation encourages readers to click on the links provided to read full articles on the game action. Nyheim Hines rushed for 134 yards and two touchdowns as Garner defeated Knightdale 28-7. Duke Head Coach David Cutcliffe was in attendance at the game watching the four star running back prospect. 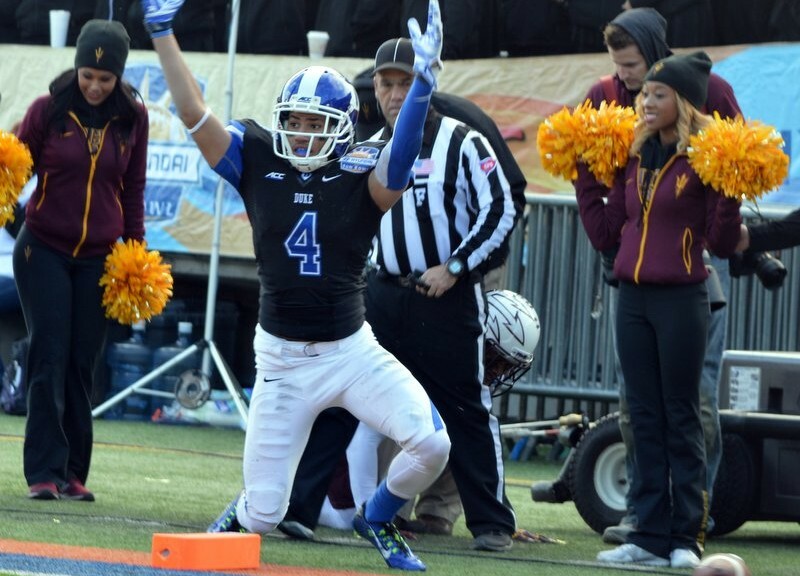 Running back remains the top position of need for the Blue Devils 2015 recruiting class. Albert Funderburke did not have an enjoyable Friday night as his Sun Valley team was shutout by Weddington 34-0. Ruben Garnett rushed for 117 yards and two touchdowns in the 1st half as Aquinas routed Warren County 43-14. Garnett ran 34 yards for a touchdown in the 1st quarter and added a one yard touchdown in the 2nd quarter. Aaron Young had 86 yards receiving and two touchdowns as Murietta Valley defeated Chaparral 21-14 in double overtime. Young's four yard touchdown reception was the game winner. Keyston Fuller caught three touchdown passes as Griffin dominated Pike 57-7. Fuller's three touchdown receptions covered three, 13 and 21 yards. Fuller has caught eight touchdown passes this season. Quentin Harris racked up the statistics on Saturday afternoon completing 27 passess for 332 yards and three touchdowns to go along with 62 rushing yards, on 13 carries, but Taft School lost to Salisbury 63-28. Taft's record falls to 1-5 on the season. DePriest Turner threw a 64 yard touchdown pass and ran for a second score in a losing effort as Fairhope downed Murphy 54-30. Turner finished the game with 154 yards passing and 117 yards rushing. 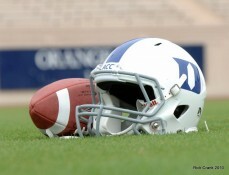 Turner is committed to Duke as a wide receiver. Class of 2016 running back commit Elijah Deveaux scored two touchdowns on runs of 25 and 10 yards as Charlotte Christian defeated Ravenscroft 44-0. Brandon McIlwain, a 2016 quarterback prospect, rushed for 125 yards and four touchdowns, in addition to passing for 381 yards, but his Council Rock North team fell to Quakertown 48-32. After verbally committing to Duke on Friday afternoon, 2016 running back Elijah Deveaux rushed for 250 yards and three touchdowns on 21 carries Friday night as Charlotte Christian defeated Carolina Pride 62-19. 2016 wide receiver Scott Bracey caught a 44 yard touchdown pass as Benedictine defeated Bishop Ireton 29-26 on Saturday afternoon. Wide receiver T.J. Rahming had three receptions for 102 yards and a touchdown as McEachern defeated North Cobb 48-28. Rahming's touchdown catch covered 43 yards. He also rushed three times for 41 yards. Wide receiver Keyston Fuller caught a 74 yard touchdown pass in the 2nd quarter as Griffin defeated Mt. Zion-Jonesboro 41-16. Fuller was the game's leading receiver with three receptions for 81 yards. Wide receiver Aaron Young returned a kick-off to the opponent's 48 yard line to setup the tying touchdown and Murrieta Valley went on to defeat Murrieta Mesa 50-47 in overtime. Quarterback Quentin Harris threw two touchdown passes for 61 and nine yards, but Taft School fell to Choate 58-13. 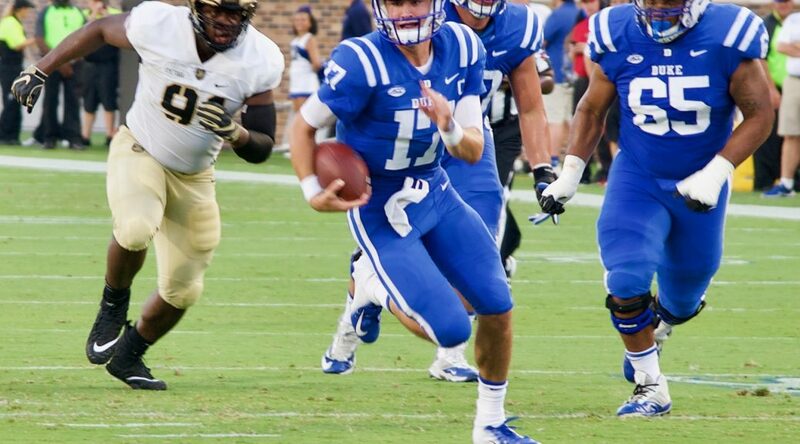 Harris completed 36 of 56 pass attempts for 309 yards, two touchdowns and an interception. Top 2015 running back target Nyheim Hines ran for 147 yards and four touchdowns on 14 carries as Garner destroyed Clayton 63-10. In the amazing performances category, 2015 running back target Albert Funderburke rushed for a Union County record 457 yards in Sun Valley's 74-58 win over Piedmont. Funderburke rushed for five touchdowns including two of 71 yards each. His other three touchdown runs covered 42, 35 and seven yards. 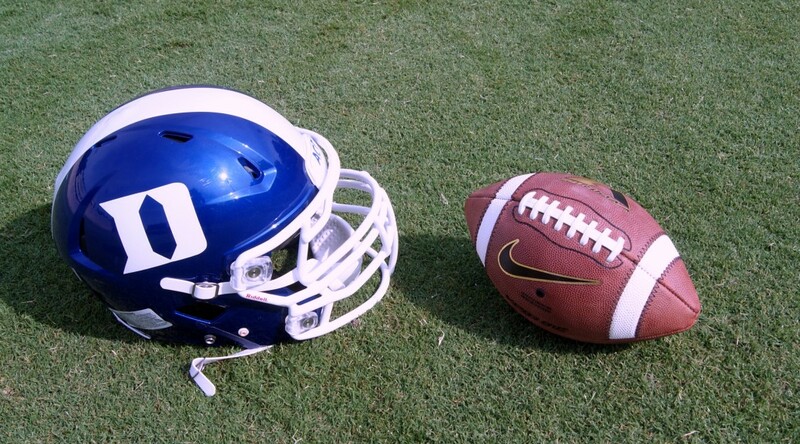 Welcome back Blue Devil faithful to Friday Night Lights Edition No 5 where Blue Devil Nation keeps you updated on the high school gridiron action for future Blue Devils and recruiting targets. 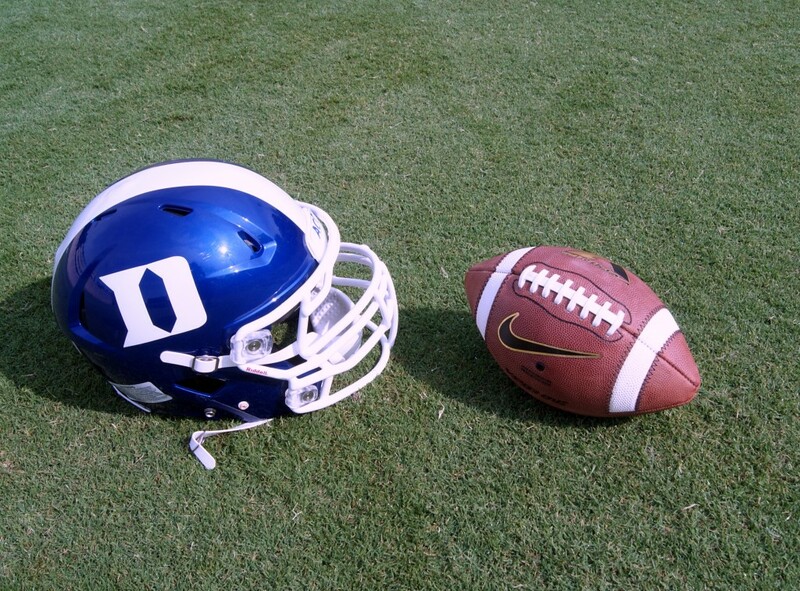 Duke is still looking to add a running back to their 2015 class so this update will start with running back action. Nyheim Hines rushed for 202 yards and four touchdowns as Garner defeated West Johnston 56-14 to improve to 5-1 on the season. 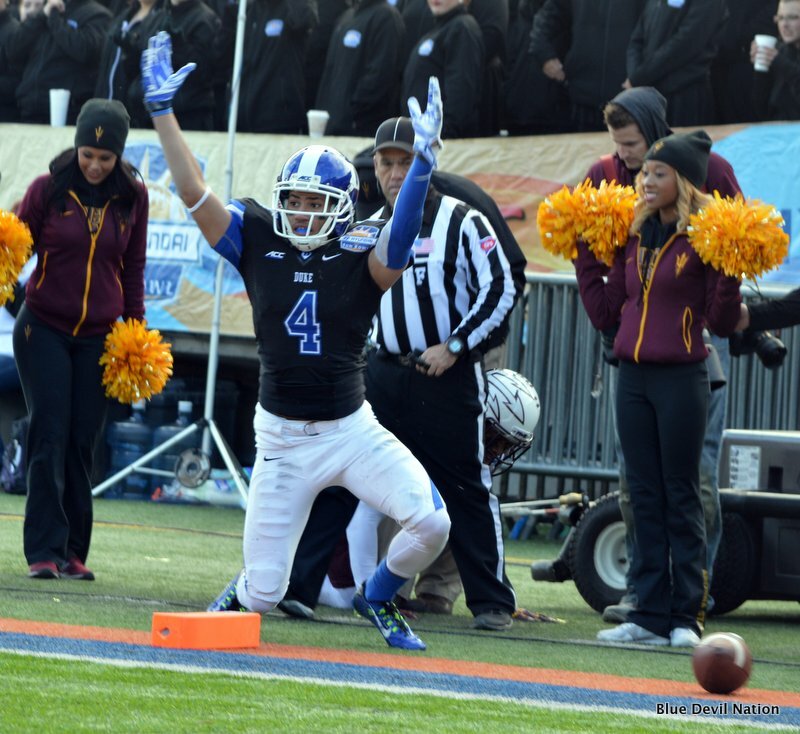 Additionally, Hines returned a kick-off 75 yards for a touchdown. He has rushed for 1,135 yards on the season. Ruben Garnett rushed for 120 yards and a touchdown as Aquinas won their 20th straight game 31-6 over Hancock Central. Garnett's touchdown run was for 16 yards in the 2nd quarter. Trai Sharp sprained his right ankle on his second carry of the game and did not return to action. Carrboro lost to Randleman 27-20. Turning to a couple of 2016 targets, Elijah Deveaux ran for 196 yards including a 48 yard touchdown as Charlotte Christian defeated Charlotte Latin 30-20. Antonio Williams rushed for 310 yards as North Stanley defeated North Moore 42-9. Wide receiver commit T.J. Rahming recorded seven catches for 90 yards including a 16 yard touchdown reception as McEachern defeated Marietta 37-23. Wide receiver commit Aaron Young recorded six catches for 88 yards and two touchdowns but Murrieta Valley dropped a 38-35 decision to Elsinore. Wide receiver commit Keyston Fuller and the Griffin Bears were idle on Friday night but here is a link to a nice article on the team's 5-0 start. Wide receiver commit DePriest Turner, who plays quarterback for his high school team, rushed for three touchdowns and passed for another as Murphy defeated Davidson 27-14. Turner's three rushing touchdowns covered 24, six and 11 yards, while his touchdown pass went for 28. Quentin Harris threw a 16 yard touchdown pass to lead the Taft School to an 8-6 win over Trinity-Pawling. Welcome back Blue Devil faithful to another edition of Friday Night Lights where Blue Devil Nation keeps its readers informed on high school performances of future Blue Devils and Duke recruiting targets! California Tight end Tyler Petite caught two passes for 84 yards including a 47 yard touchdown as Campolindo outscored Heritage 56-31. Staying with the California commits, Murietta Valley defeated Temescal Canyon 46-20 with wide receiver Aaron Young catching a touchdown pass. Complete statistics and a game recap were not located but here is a nice picture of Young's scoring reception. Young is 6'5" and the picture shows him using his height to beat a shorter defender. Nyheim Hines rambled for 183 yards and four touchdowns as Garner defeated Cleveland 44-21 on Thursday night. Hines fourth touchdown was a 96 yard run. His earlier scores covered 12, 10 and two yards. Hines now has 350 yards rushing with five touchdowns on the season. These are numbers which will grow week by week. Reggie Gallaspy rushed for 241 yards and four touchdowns as Southern Guilford rolled over Grimsley 43-7. Gallaspy's first touchdown was a 53 yard run in the 1st Quarter. His other three scoring runs were for one, three and three yards. Gallaspy now has 487 yards and seven touchdowns on the season. Ruben Garnett scored four touchdowns, two rushing and two receiving, as Aquinas topped Prince Avenue 33-18. Garnett rushed 32 times for 230 yards and caught two passes for 72 yards in the victory. Garnett now has 411 yards and six rushing touchdowns on the season. Trai Sharp rushed for 186 yards and three touchdowns as Carrboro defeated East Chapel Hill 45-12. On Carrboro's first play from scrimmage, Sharp ran 71 yards for a touchdown. His other two touchdown runs covered 25 and 21 yards. 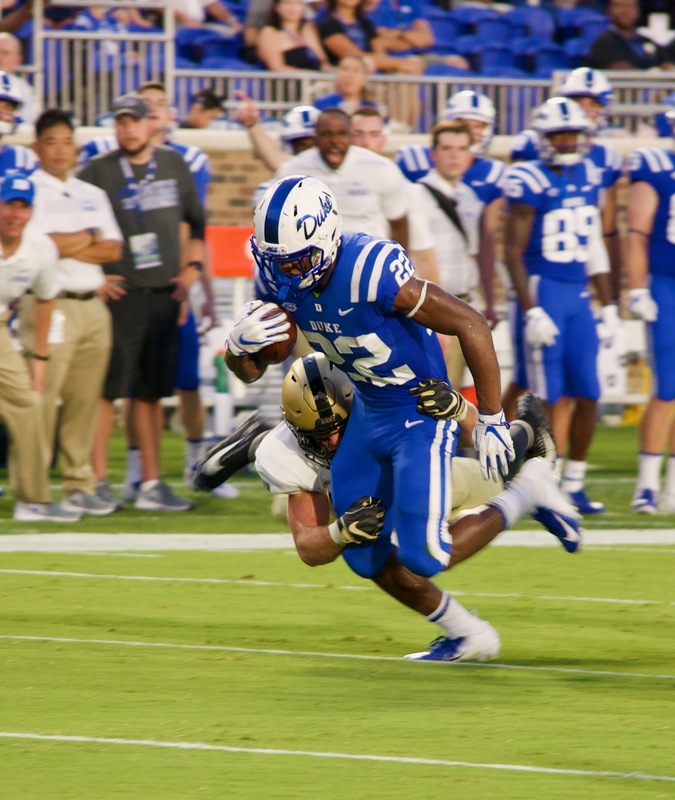 Duke is looking to add a running back to their 2015 recruiting class and the performances of the players listed above shows there is talent still available. Be sure and check back next week for another edition of Friday Night Lights at Blue Devil Nation.